Inside your home is the place where you usually have the most control over the waste you and your family generates. After all, you and your family do the shopping for most of what goes in there throughout the years. If you want to cut down on the waste you’re generating, home is the place to do it. 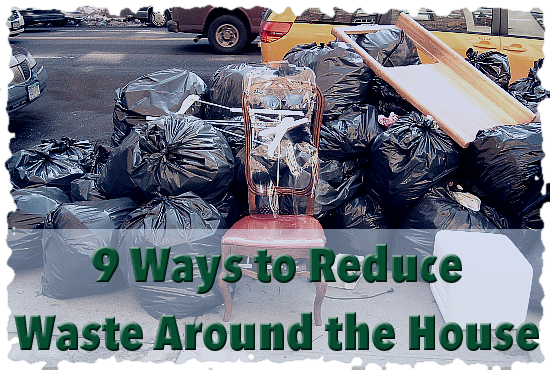 Here are 9 tips to help you reduce waste around your home. So obvious, yet so difficult at times. The less stuff you buy, the less waste you’ll generate. Not everything has to be bought new. There are so many things you can quite reasonably buy used, and that means less waste. Not only does it mean that fewer resources are consumed to make new products, used products often have far less packaging, depending on the source. Certainly items from thrift stores have very little packaging on the whole, however refurbished items may be packaged more or less like new ones. Still, refurbished items are less wasteful than new. And of course, don’t forget handmedowns. This has saved me a ton of money in children’s clothes, as my sisters and I pass clothing down from child to child to child. There are so many things you can buy in reusable forms rather than disposable. Grocery bags. Water bottles. Batteries. Any time you need to buy something disposable, think about whether the reusable version might do as well or better. When reasonable, buy things in bulk rather than in smaller packages. Some grocery stores have bulk bins, which can make it very easy to buy certain types of food in larger quantities. Other items can be bought in bulk too. If your family tends to go through something regularly, take a look at how you can buy and store larger quantities. That way you won’t have to go out to buy them as often. 5. Cut down on food waste. Pay attention to the foods you have on hand, and use up as much as possible before it spoils. In many families, leftovers are a major source of food waste, but there are ways to limit it. You can freeze leftovers into quick meals, for example, so that they last longer and may even be portable for those who work outside the home to bring to work for lunch. 6. Get off mailing lists. Odds are good that you get a lot of mail you simply are not interested in. You can cut back on this by opting out of many mailing lists. The Direct Marketing Association provides this service for a fee. You can contact companies about catalogs you receive but do not want and get off their lists. You can also contact the credit reporting bureaus and request through each of them that you want off their mailing lists. It takes some time for your name to get off all the lists. They aren’t updated every month, but over the course of a few months, the junk mail should decrease. Composting not only helps you decrease your waste, but gives you something beneficial for your garden. Outdoor compost bins or piles are the traditional ways to go, but there are ways you can compost indoors too. 8. Donate or sell old items. Many things that you’re done using are still perfectly good for someone else. We recently replaced our old couch, for example, and after getting no interest in anyone buying it, we donated it to charity. Charities can be pretty picky about what they’ll accept, as they mostly want to be able to sell what they pick up from you. Garage sales are another great way to go. You can sell off old clothes, toys or whatever else you have around the house you want to get rid of, and make a little money while doing so. There may be a lot of things you can recycle, paper, plastic, glass bottles, aluminum cans, etc., depending on the programs available in your area. The recycling company in our area, for example, accepts all numbered plastics, but in other areas only plastics numbered 1 or 2 will be accepted. Plastic shopping bags can be recycled at many grocery stores, for those times you didn’t have a reusable bag on hand. Old appliances can often be recycled too. Check for programs in your area.